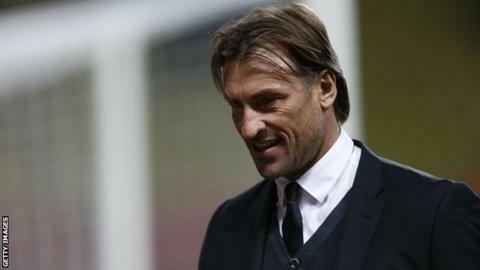 Sochaux coach Herve Renard has distanced himself from reports he could become the next coach of Morocco. Morocco are seeking to install a permanent replacement for Rashid Taoussi, who was sacked last year. The Atlas Lions are believed to want 45-year-old Renard, who won the 2012 Africa Cup of Nations with Zambia. However, Renard told BBC Sport: "At the moment I am in France and my first priority is to stay in Europe - at Sochaux or to move to a better team." He added: "You never know in advance in football so I have to concentrate on my mission with my club. In one month we will know where I am going." Renard took over at the French Ligue 1 club in October 2013, after ending his 33-month reign as Chipolopolo boss. The transition from national manager in Africa to club boss in Europe has not been an easy one, with Renard admitting "life was very difficult in November and December, just after I came back to France". Sochaux are currently in the relegation places, sitting 18th in the table out of 20 teams, and the Frenchman is desperate to make up the two-point gap to their nearest places rivals to avoid the drop. "We have a big mission to keep the team in Ligue 1. We have four game remaining - four tough games - but I am sure we will be able to stay in the top division," he said.